Inventory We are a resale marketplace, not a box office or venue. Ticket prices may exceed face value. This site is not owned by PNC Arena . The PNC Arena located in Raleigh, North Carolina is a great venue nestled in the research triangle. The silicon valley of the South has a hidden gem in the PNC Arena. The PNC Arena is the home to the Carolina Hurricanes and NHL Stalwart and consistent contender for the Stanley Cup. Outside of the world of hockey and the NHL the PNC Arena has hosted many college basketball games for the NC State Wolfpack. In 2003, a massive ribbon board was installed in the arena to encompass the entire bowl. 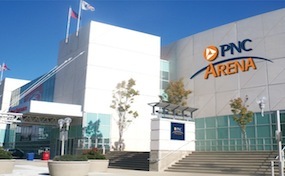 In 2016 the arena will undergo changes to their entrances as well as restrooms and seating. Daktronics, a popular name in scoreboard technology, was hired to create an all new scoreboard for the venue in 2009 and the current display piece has been active ever since. PNC.ArenaRaleigh.com is a privately held company that specializes in the resale of tickets in the secondary market. We are not affiliated with the PNC Arena the Carolina Hurricanes or any official supplier or box office. To purchase tickets to any PNC Arena events simply call our operators at anytime or click on the event you wish to attend.